It is the mission of the music department to develop a life-long love for music and to be salt and light in the world through musical excellence. All students, kindergarten through sixth grade, participate in the annual Christmas program. Grades one and two enjoy a weekly general music class with an experienced music teacher. 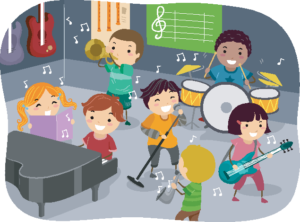 Instruction includes singing, rhythms, and introductory music theory. Choir is available to students in third through sixth grades. It meets on Tuesdays and Thursdays, from 7:30 to 8:30 a.m. Our choir participates in the Christmas program, choir chapel, the ACSI Choir Festival, and the Spring Concert. Mrs. Jill McGuyre is our choir director. All students, fourth through sixth grades, are eligible to be part of the band program. Beginning Band is available to all first-year students. Rehearsals are held once a week before school. All second- and third-year students who have made sufficient progress on their instruments can join Concert Band. Weekly rehearsals are scheduled before school on Fridays and during recess on Wednesdays. Both Beginning and Concert Bands perform at the Christmas program, two band chapels, the ACSI Band Festival, and the Spring Concert. Concert Band members may audition for the Area Honor Band, which performs at a local theme park. Participation in Jazz Band is on an audition-only basis. It performs at the Christmas program, band chapels, local Jazz festivals, and the Spring Concert. Each year our Jazz Band receives an invitation to play at Disneyland. Jazz Band rehearses twice weekly during recess. All Jazz Band members are also in Concert Band. All band members take private lessons as well. The cost of these lessons is the responsibility of the parents. Lessons are given before, during, and after school. Each student is scheduled for a time mutually suitable for the student, parent, classroom teacher, and band director. Piano lessons are also offered at our school with Mrs. Sara Dolmage. Parents make arrangements for these lessons with the piano teacher. Shopping for an instrument for your child?